Eeyore used to be my role model. Fun times. 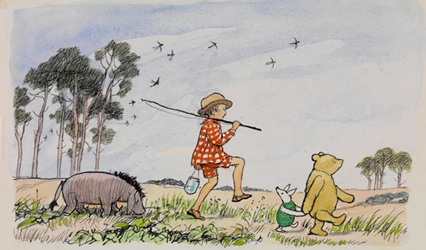 When I was little my family owned an audio recording of The House at Pooh Corner by A.A. Milne, which we often listened to on long car trips. This particular recording read by Norman Shelley also included the piano music to all the hums composed by H. Fraser-Simon. My aunt gave us the recording and also played the songs on the piano for us. Her delight in them was infectious and I loved the stories. Then one day, when I was a teenager I listened to the audio book again. That’s when I realised that The House at Pooh Corner is hilarious. Up until then I had taken the stories relatively literally. I thought Eeyore just needed to cheer up, worried for Tigger when he was starving hungry or stuck in a tree and assumed that Owl really was very clever. As a fourteen year old I suddenly realised that the stories were operating on a whole other level and on that level A.A. Milne was taking the piss. In particular, I was very attracted to Eeyore’s dark sarcasm. I felt like I was surrounded by falsely cheerful people who did not understand the true meaningless of existence. They were like Winnie the Pooh with their heads in the honey pot mumbling complete nonsense, whereas Eeyore might be gloomy, but at least he was coming up with some good lines. I started to tell people that Eeyore was my role model. This was usually met by a laugh or eye-rolling depending on how fed up people were with my sullen and grumpy behaviour. In wanting to be like Eeyore I had failed to realise that yes, he was occasionally funny, and he did bring some welcome cynicism to the Hundred Acre Wood, but he was largely a pain in the arse. I felt an affinity with Eeyore because he was gloomy but I aspired to be like him because he was funny. In the end I was one and not the other, and not the good way around. And every time I think I should do something, and actually wish I would do it, but also know it goes against my very nature (like dancing while sober, or speaking confidently in a second-language) I think, ‘We can’t all, and some of us don’t. That’s all there is to it.’ It’s very comforting. Cheers Eeyore. As a white girl growing up in country Victoria I didn’t have much personal experience of racism when I was a kid. Or at least it wasn’t directed at me, and I don’t remember it. I think I learned about racism through books. The first one I remember was an audio book called The Diddakoi by Rumer Godden. It was about a Roma girl called Kizzy who lives with her grandmother in a caravan in England. They have a lovely life together, which is presented in a very positive way. When her grandmother dies Kizzy’s life becomes very hard as an outsider in the community. She is teased by other children and excluded and ridiculed by many adults as well. This book made me very angry. I could see very clearly how terrible and unfair racism was. I was outraged that people would behave that way. The people in the book lived nearly 20,000 kilometres away but it was a universal lesson. After listening to that book, I knew that racism was bad everywhere. I also developed a strong conviction that I would not be like that. I would stand up and say something. Today I hear people using the word gypsy as a socially acceptable derogatory term and I find it shocking. Perhaps for Australians it sounds like a fun word, colourful, a bit unusual and unconnected to any real people who might be hurt by it. I don’t like it, but I’ve never said anything. I’m probably worried about how people would react and don’t want to make a fuss. Some people would roll their eyes and think it was Political Correctness Gone Too Far Again. Is there to be no culture we can mock? How will we have fun? How will we express ourselves? Is life worth living if we can’t call the incompetent finance officer at the stationary suppliers a gypsy? Here’s something I’m not proud of: I went through a phase in my twenties where I used the word retarded quite a lot. I used it in an ironic way. I was referencing juvenile primary school insults in a self-mocking way. I wasn’t making fun of disabled people, I was making fun of people who made fun of disabled people. That’s what I thought. Anyway, it was fun, I liked the way it sounded, and people often laughed when I said it. Until one day I used the word in front of my housemate. She didn’t say anything, she just looked like all the fun had gone. I remembered that her brother had an intellectual disability. I apologised to her. She was nice about it and said that she’d grown up hearing that word a lot and she hated it. I’m embarrassed that I lacked the imagination to see how hurtful this word can be (even with a myriad of ironic, well-meaning, self-mocking justifications) before being told. I stopped saying it. Sometimes it made people laugh, but it wasn’t worth it. It’s one thing to use a word when you don’t understand how it affects other people, it’s another to keep using it after you’ve been told. I probably should say something. I watched an episode of Jennifer Byrne Presents this week on Bragging Rights. The panelists were discussing books that are famously difficult to read. Lawrence Mooney was adamant that listening to the audio book doesn’t count. He described a ‘dirty world’ of cheats listening to recorded books in their cars. I was pleased that Jennifer Byrne disagreed with him. But Mooney’s opinion on audio books as lazy cheating is one I’ve heard before, and I disagree pretty strongly and get a bit fired up. I’ve listened to audio books since I was ten. Through audio books I was introduced to wonderful writers like PG Wodehouse and Muriel Spark. Most memorably, my sister and I listened to The Outsiders by S. E. Hinton. Usually, when we listened to story tapes, I would do other things at the same time like rearranging my horse-shoe collection or making a collage of all my favorite horses. But soon after starting The Outsiders my sister and I were lying on our bunk beds absolutely mesmerized by the story. Every half hour one of us would get up to turn over the cassette. We listened to the whole thing that afternoon. Then we made all our friends listen to it, and they loved it too. We appreciated and engaged with The Outsiders even though we listened to it instead of reading it. Reading to children is considered one of the most important things you can do for their development. Reading aloud to kids makes it more likely that they’ll be lovers of books. It seems a shame that at some point in our lives the enjoyment of aural words becomes considered lazy or weak. People like listening to stories. Recently reading has become an almost entirely solitary pursuit but in the past, reading aloud was very common and books were written to be enjoyed aurally as well as on the page. Even now, authors still read aloud from their books at speaking events. We keep doing it because people enjoy it (and it fills up time on the program). I listen to at least one audio book a week. The kind of books I listen to are different from the ones I read. I can’t listen to anything too complicated as an audio book because I find it harder to listen to audio books than to read. I think there’s a few reasons for this. My mind can wander and accidentally tune out the sound. It’s harder to go back and check a detail earlier in the book. I can’t control the pace of an audio book. It’s harder to stop and think if I need to. So if someone listened to a big difficult classic on audio book, I wouldn’t accuse them of cheating, I would be very impressed. I think some people believe that listening to an audio book is like watching the film of a book. I don’t think watching a film is cheating, but I agree that it’s not equivalent to reading the book. But listening to an audio book gives you one-to-one access to the words the book contains. You are experiencing the same words. The medium does make it a different experience, but one isn’t superior to the other. In The Outsiders Ponyboy reads Gone with the Wind aloud to Johnny, who can’t read well. Johnny loves the book and is very taken with the imagery of the southern gentlemen riding to the war. Ponyboy also reads him a Robert Frost poem with the line ‘nothing gold can stay’. In one of the most memorable passages in the book, Johnny later tells Ponyboy to ‘Stay gold’. Johnny appreciated and engaged with the words even though he listened instead of reading them. It’s not a dirty world of cheating, it’s fantastic. Who are audio books for? When I was in high school I convinced a friend of mine who wasn’t that into reading to try an audio book. She borrowed one from the library but she didn’t listen to it. Her mum made her take it back because “the audio books are for blind people”. According to my friend’s mum, I may as well park in a disabled space without a sticker. But that isn’t right (I felt that quite strongly at the time but couldn’t articulate why). The car parks close to Coles have no capacity to increase, but the number of audio books can.When I borrow an audio book from the library I am increasing the borrowing rate, which makes it more likely that the library will buy more titles, which increases the resource rather than diminishing it. I’m a champion! The sad thing is that my friend missed out because of her mum’s prejudice against audio books. Her attitude is not uncommon. A lot of people think it’s lazy to listen to audio books if you can read the book. But the truth is, not everyone enjoys reading. That doesn’t necessarily mean they don’t like words or stories. Anyway, I can’t read and cook at the same time. I need audio books. 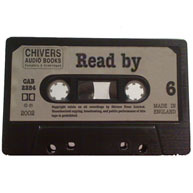 My first ever story tape was an Enid Blyton Famous Five. I was in Grade 4 and I don’t know why I borrowed it from the library because by that stage I was in my “I only like books about wars and/or death” stage. A couple of years ago I listened to a Mallory Towers story tape. I remember reading the series when I was a kid and thinking it was a bloody weird, but enticing world of midnight sausages and hockey. When I listened to the story tape as an adult I realised it’s not just their timing of snacks that is strange – the plots are like a here’s how of bullying and are very different to books written now. In the world of contemporary Children’s Literature: Kid is different. Kid realises being different is okay through appropriate role models and character building experiences. In the world of Mallory Towers: Girl is different. Girl realises she should stop being different after being shouted at and excluded from the hockey tournament. OR Girl does not stop being different and is punished. Anyway, back when I was in the Fourth at Newstead Primary School, my family listened to the Famous Five story tape in the car on the way to Wangaratta. It made the trip go a lot faster. Before I knew it, we were in Violet Town and I was a story tape lover. Well, bits of it anyway. I’m about half way through the 28 hour long audio book The Calamitous 14th Century, but I think I’ve actually heard about half of it. The other half I’ve missed while doing incompatible activities at the same time like having a shower, putting on the washing or reading articles about Ricky Nixon’s disgraceful hair and conduct. I normally stop audio books if I’m doing an incompatible activity but not with this one. The great thing about the 14th century is that the same things happens over and over again. War, plague, war, plague, nice trip to the country, war, plague. So I’m finding it quite easy to dip in and out of the narrative, missing chunks of it, but still getting the general idea. I’m glad there won’t be a test.